Ah, the great outdoors… the sound of rushing water and birds chirping in the trees, the scent of wildflowers and plants, the light breeze blowing across your face. If only there was a way to enjoy these things without having to endure sleeping in a lumpy sleeping bag over hard rocks, a flat pillow, and missing all the luxuries of home while out in the wild. Well there is! It’s called glamping. Glamping = glamorous + camping. It’s a way of enjoying the great outdoors without having to endure the great outdoors. It’s a cross between a hotel stay and regular camping, and it’s my new favorite way to enjoy nature! There is no real right or wrong way to go glamping. It is definitely up to your individual interpretation and personal taste and comfort level as to how far you go with it. 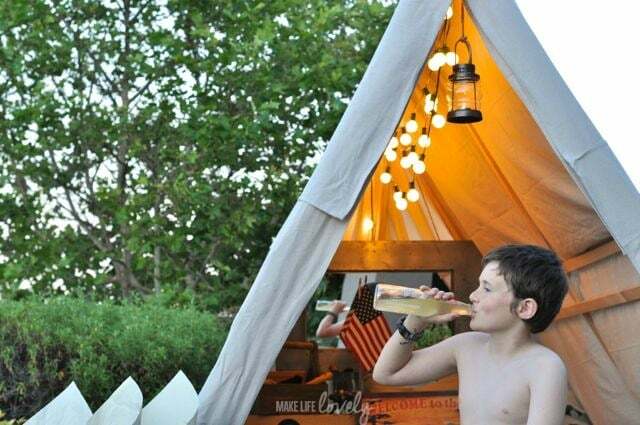 Today I’m going to share with you some glamping tips and ideas that I have learned to help you go from roughing it to loving it! Here’s what my family recently put together for our outdoor glamping adventure that worked really well for us. 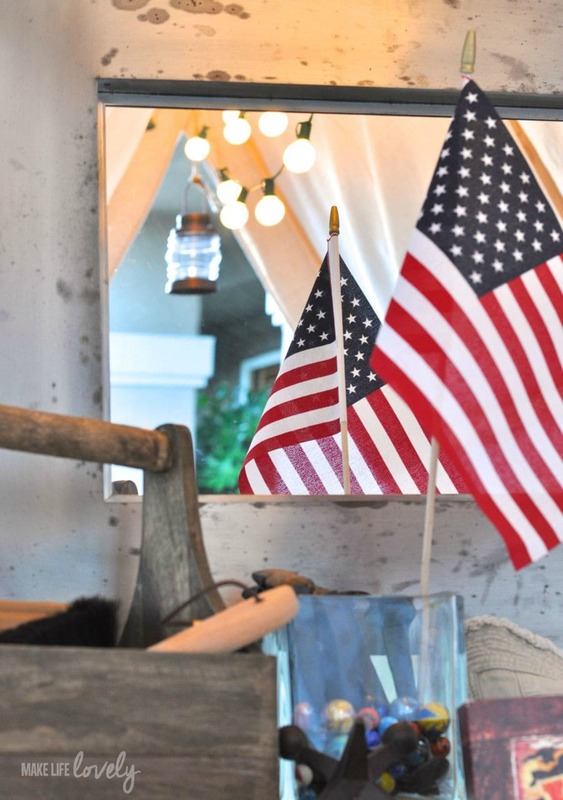 Hopefully it will help you get some ideas to glam up your next camping trip! 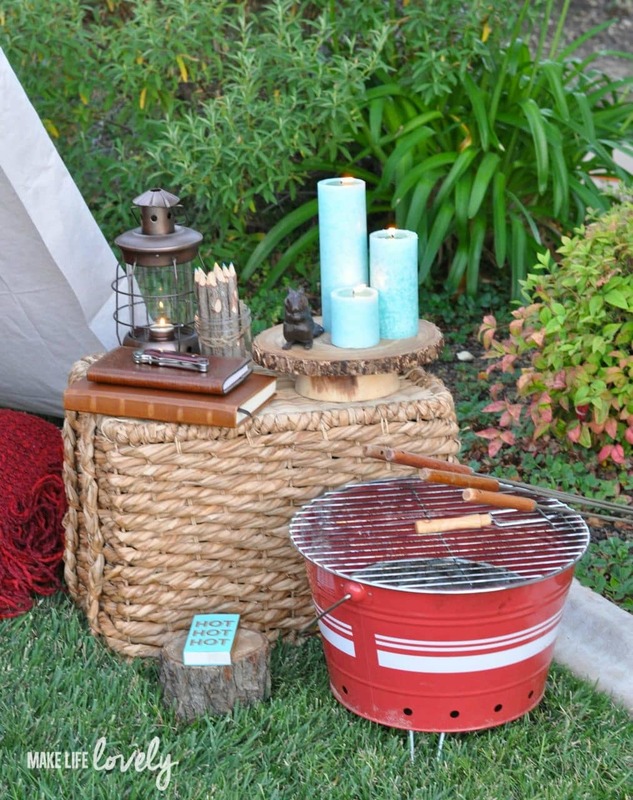 This Glamping Tips and Ideas post is brought to you by World Market. All opinions are always 100% my own. Four our shelter, my husband and I built a lovely A-frame tent. We picked up some drop cloths and wood, and easily built a structure that was solid and cozy. 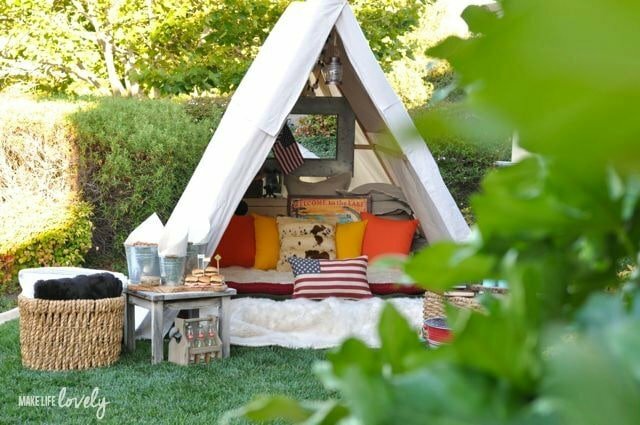 You can also use a tent, a tepee, a camper, or what you already have on hand. This is one of my favorite parts of glamping… soft and luxurious bedding! Goodbye flat sleeping bags, hello soft blankets and fluffy pillows! We used a large air mattress that we already owned as our bed. 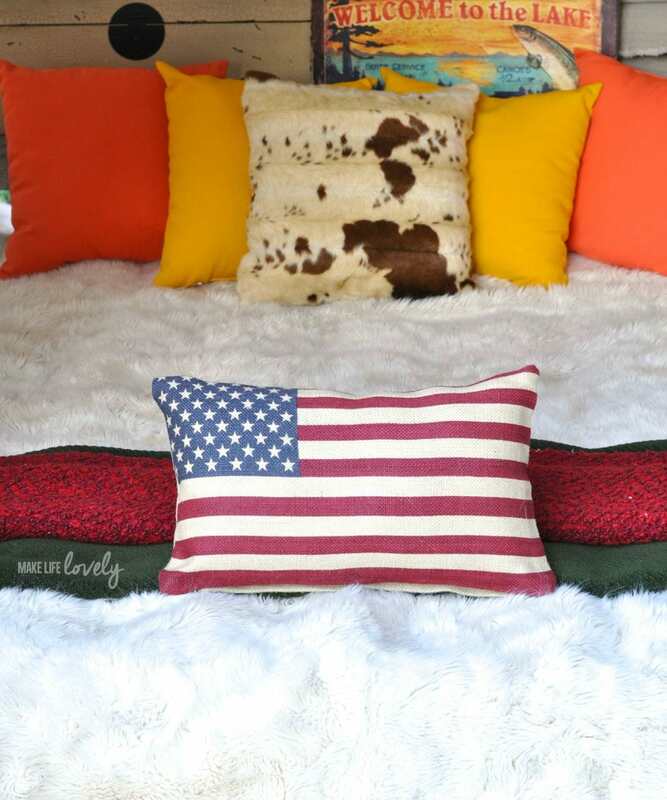 We used a large luxurious white faux fur blanket as the basis for the bedding, and then added some throw blankets and colorful pillows for some added comfort and warmth. 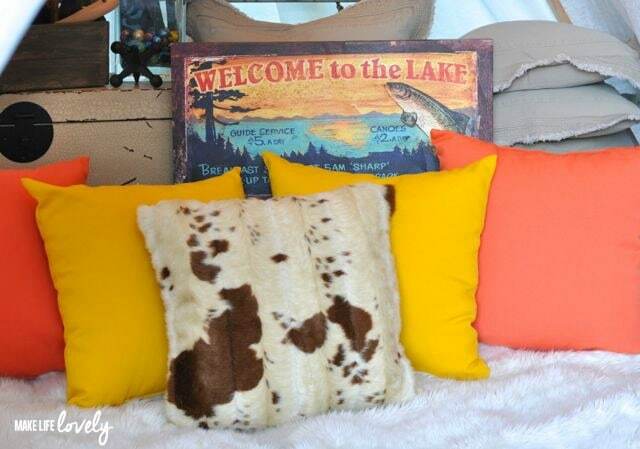 One of my favorites is the adorable Faux Cowhide throw pillow I found at World Market. It was so soft, and I love the rustic American feel it gave to our bed! 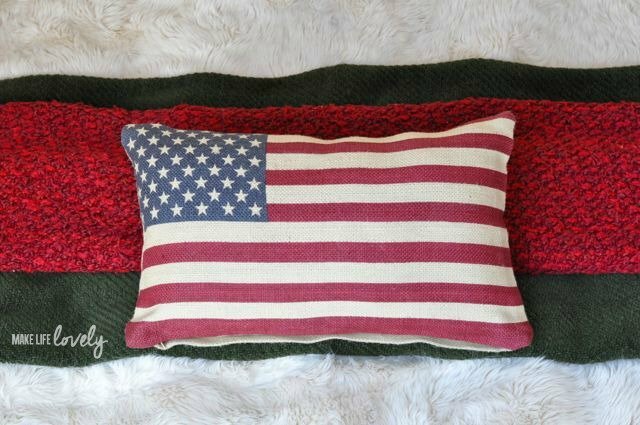 Another favorite is the American Flag pillow that’s just perfect for this time of year! I bought mine last year at World Market, but this year’s version is very similar. We had extra pillows on hand in case anyone needed more, because really, can you ever have too many pillows? When camping the old fashioned way, a flashlight and a lantern were all you needed to provide your light when it got dark. 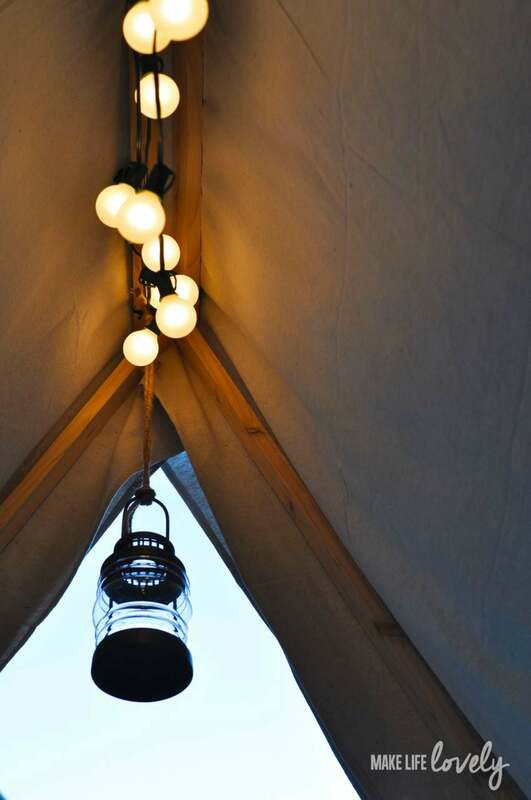 With glamping, however, lighting is a lot more fun! We used multiple forms of lighting to light up our tent and outdoor area with a soft glow. Outside the tent I lit some Mediterranean Sea Pillar Candles that really added to the comfortable atmosphere, and smelled amazing! I placed the candles on my rustic wood bark pedestal stand, which was the perfect base for the candles. Next to the candles I put a lantern that I fell in love with at World Market and had to have. Inside the tent I hung a strand of frosted bulb string lights from the top of our tent. The globe lights added such a nice soft glow when we were lying inside the tent! 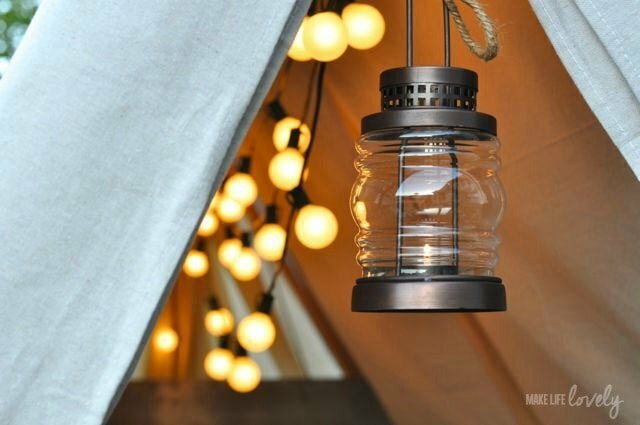 I also hung a small lantern in the front middle of our tent that I found at World Market (this one is available only in stores). You can find many more great lighting ideas here too! 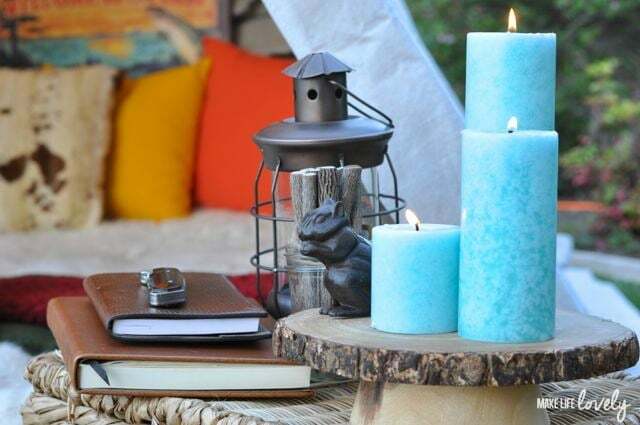 Glamping is all about including the luxuries of home that we usually don’t find out in nature. We brought a zinc mirror from home that we placed in the back of the tent so it was easy to get ready for the day. 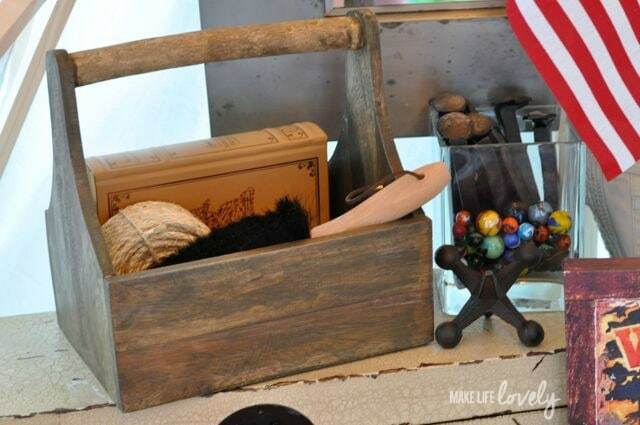 I just couldn’t resist buying the rustic wood trug, and used it to hold a brush (to easily clean and dust off any dirty surfaces and tables), some twine, and a book, because I just love to read but can’t seem to find enough time to read as much as I’d like to! The antique metal stakes, marbles, and large cast-iron jack came along from my collection at home for decoration. 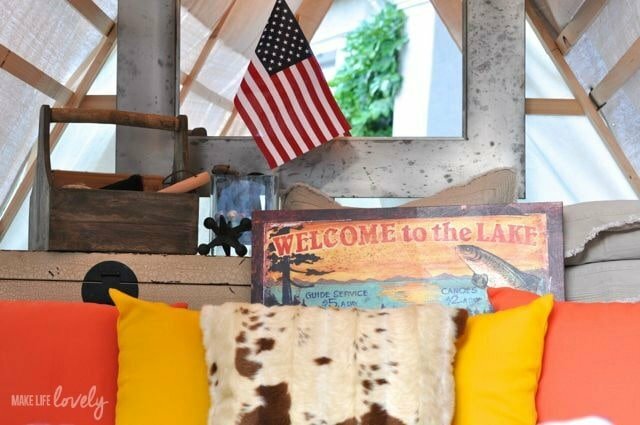 I thought the “Welcome to the Lake” vintage sign art was just perfect, so it came along with us too! Oh, and let’s not forget the American flag! It’s almost the 4th of July, so what better way to show a little patriotism for our beautiful country? We brought lots of things with us to help us enjoy our little adventure! We used one of our large natural baskets as a side table just outside the tent. Simply turn it upside down to turn the storage basket into a side table! On the side table were a couple of journals, some colored wood pencils, the lantern, candles, and wood stand that I mentioned earlier. I recently bought what has to be the cutest box of giant matches EVER that were perfect for lighting the pillar candles and the candles inside the lanterns without burning my fingers. I love when function meets fashion! The little squirrel just had to come along with us! He was another World Market find, and he’s meant to be a door stopper, but I like to use him as a decoration. 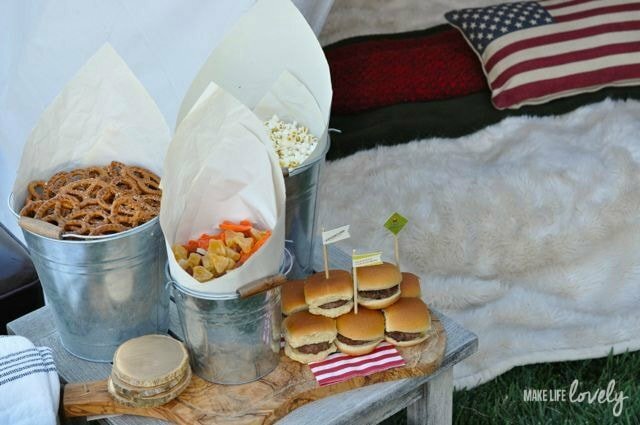 We also brought along our galvanized steel bucket grill that we use a LOT and take to the beach with us to grill. I bought this one last year at World Market, but they are selling them again this summer! It’s portable and easy to pack up with us, and works great! 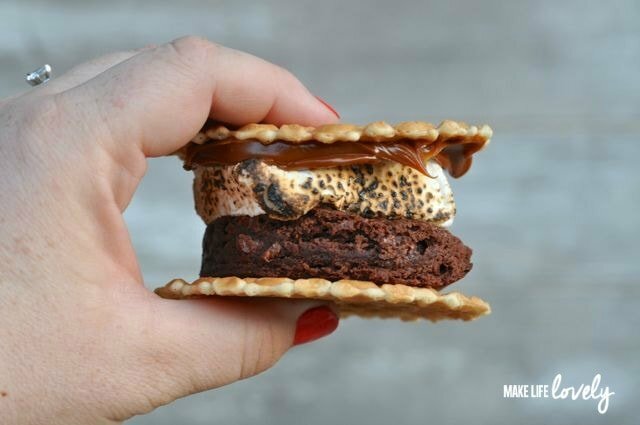 It’s also great for making s’mores… keep reading for the gourmet recipe! What would camping be without delicious food? I wanted the food to be nice and easy so I could enjoy my time outdoors. For dinner I made adorable little sliders that I prepared with the mini-hamburger slider set. 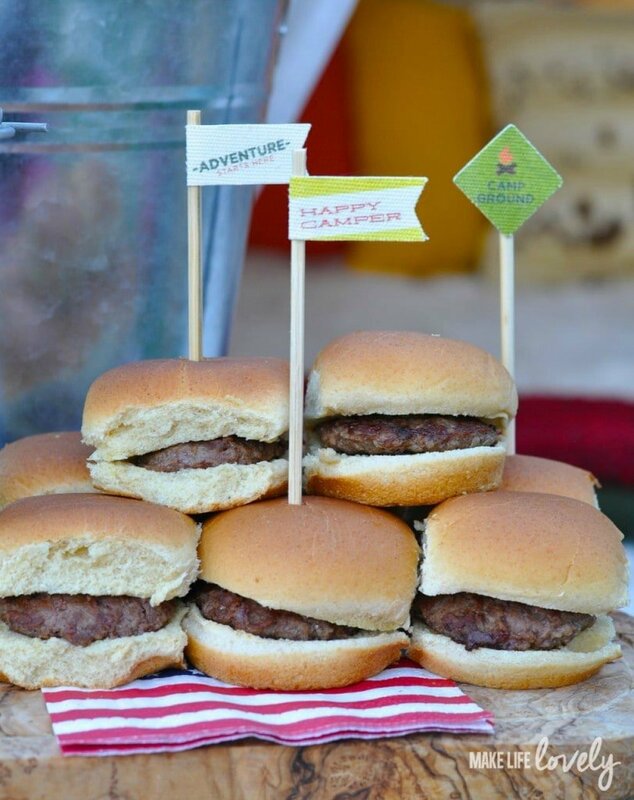 Sliders are perfect for families because some of my kids won’t eat a regular-sized hamburger, but a slider is just the perfect size! 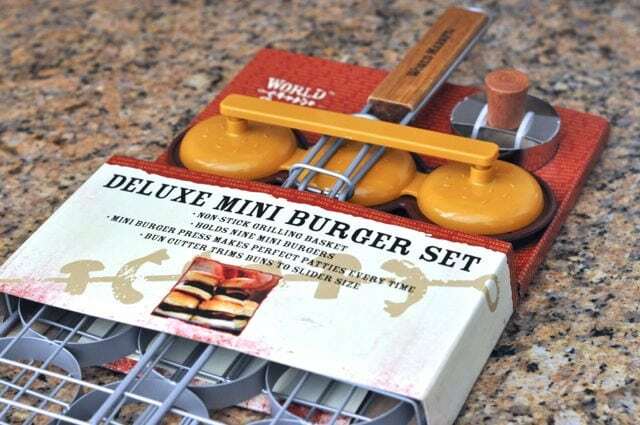 This set is great because it comes with a burger press to size the meat just right, a bun cutter to cut your regular buns down to the perfect size for your meat, and then a slider grilling basket that lets you grill 9 sliders at one time, so you don’t have to flip each one individually. I made some cute flags on sticks to put inside the sliders just for fun! For some reason we always get the munchies when camping/glamping, so we brought along some snacks we picked up from World Market. They’ve got a ton of gourmet food items that I love to stock up on! I filled some galvanized metal pails with giant sourdough pretzels, popcorn, and dried fruit and nuts. I bought a few bags of dried mango slices, dried pineapple wedges, dried cantaloupe, and roasted & salted almonds. I combined all of them together, mixed it up, and had a custom trail mix blend for us to snack on… yum! When the kids said they were hungry (with four kids this happens about every 5 minutes), I would point them in the direction of the fruit and nuts, popcorn, and pretzels. 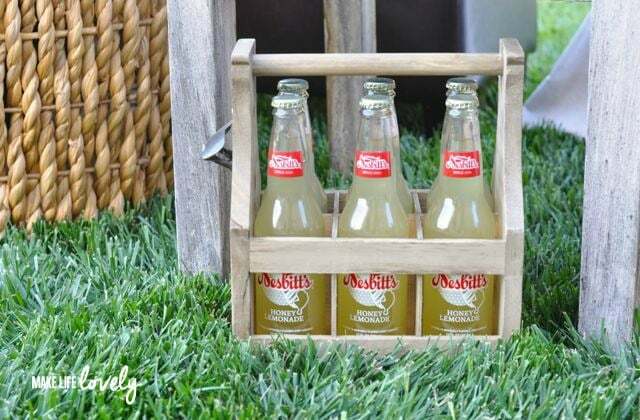 We washed down the food with some tasty honey lemonade stored in this wooden bottle caddy, complete with a metal bottle opener on the side! World Market has TONS of vintage-style soda flavors in glass bottles that I just LOVE! The kids loved the honey lemonade as much as I did, as you can see! We definitely couldn’t go glamping without some s’mores, but we decided to kick those regular old s’mores up a notch! We made brownie dulche de leche s’mores instead, and they were so rich and delicious! I bought some gourmet food items at World Market to make the perfect gourmet s’mores! I bought Pizelle Italian Waffle Cookies, Ghirardelli Double Chocolate Brownie Mix, and a jar of Dulce de Leche. I also used some flat s’mores marshmallows that I had bought. Prep was easy for these. I baked the brownies, then used a round biscuit cutter to cut the brownies into round circles ahead of time. 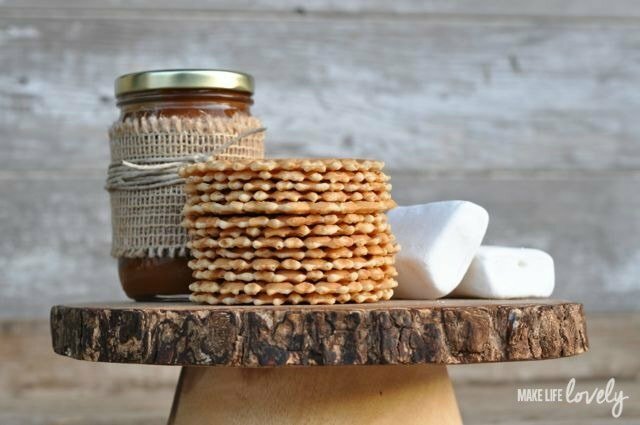 I set up all the ingredients on the wood stand: waffle cookies, brownie circles, marshmallows, and the jar of dulce de leche (along with a spoon), then let everyone assemble their own. We helped the kids with roasting the marshmallows. It was a nice change not using the traditional graham crackers. The Italian waffle cookies tasted just like waffle cones, which was pretty darn amazing. 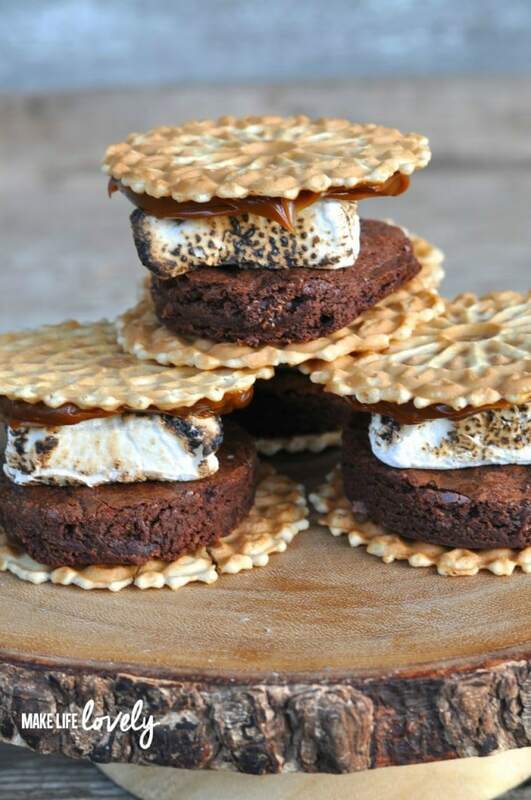 The brownies were a yummy substitution for the chocolate, and the dulche de leche was an extra added bonus to make these gourmet s’mores extra special! I’ve decided that glamping is SO much better for me than camping. 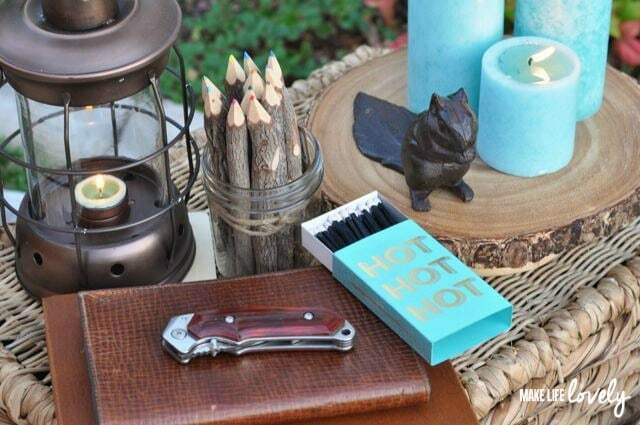 I love enjoying the little luxuries of home while enjoying nature at the same time… it’s the perfect combination! 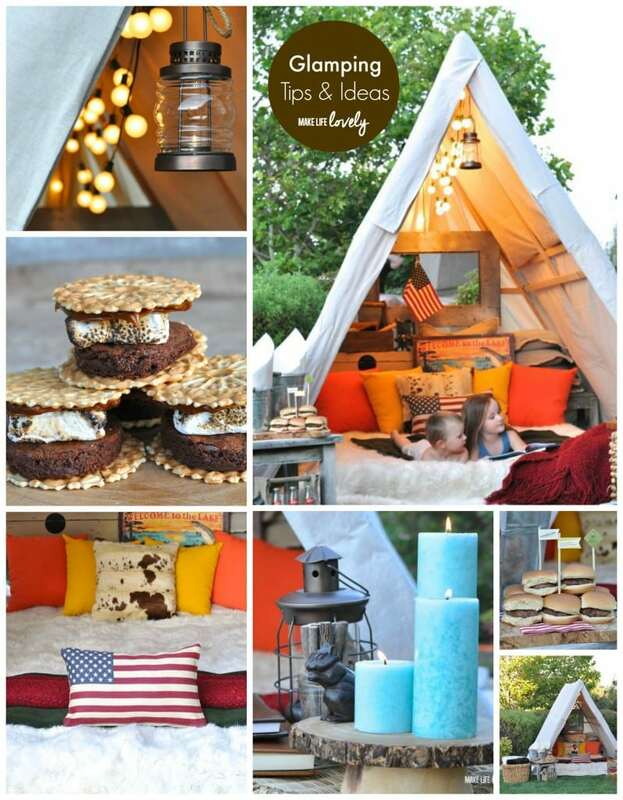 Hopefully you learned some glamping tips to add a little glamour to your camping! If you liked this glamping tips and ideas post, I would love for you to follow me on Facebook, Pinterest, Instagram, and Bloglovin’. Thanks for following! So now it’s your turn! 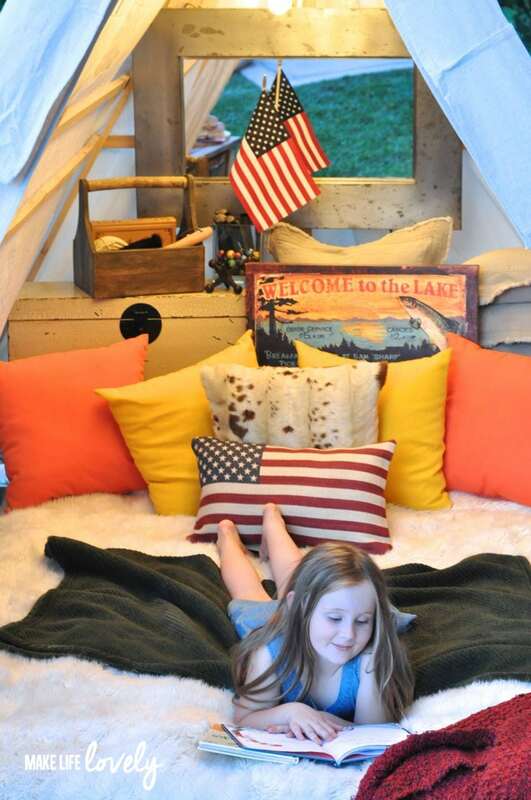 What are your top favorite things from home that you would take with you on a glamping trip? Leave me a comment below to tell me! Laura! 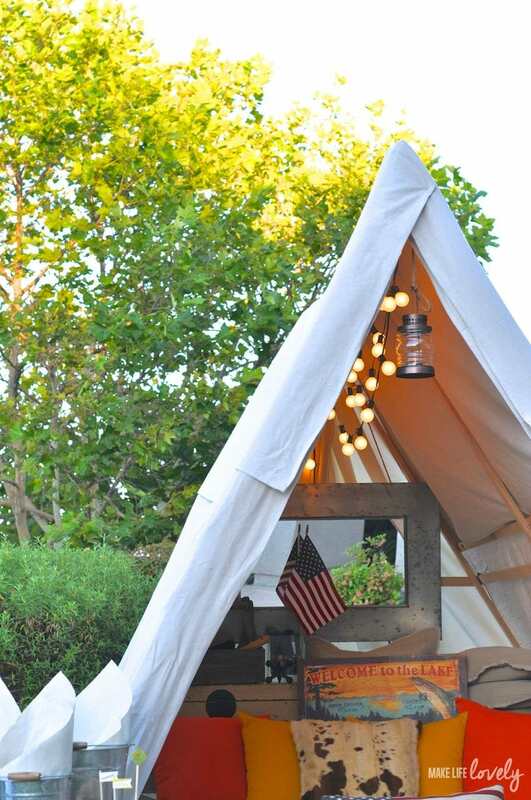 I love it, I want to come have a glamping sleepover! 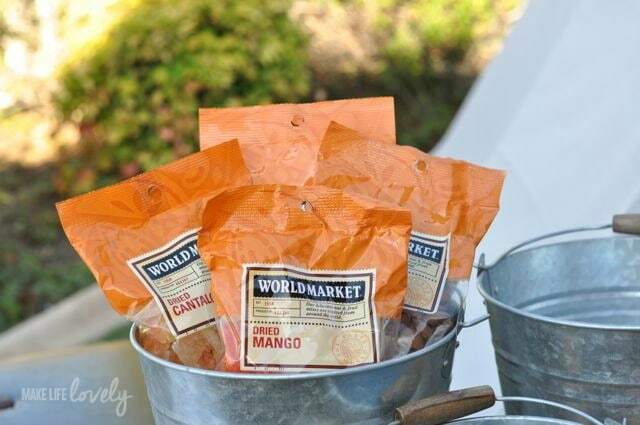 Ah I LOVE this, I’m absolutely addicted to World Market. I love camping but this is so much better! Those dulce de leche s’mores are to die for! I need to try them – glamping or not! Yes, you should! You can totally roast the marshmallows over the stove and pretend you’re out in the great outdoors. They will still taste yummy! Thanks for your comment! I love it too! All you need is an outdoor screen and movie projector! 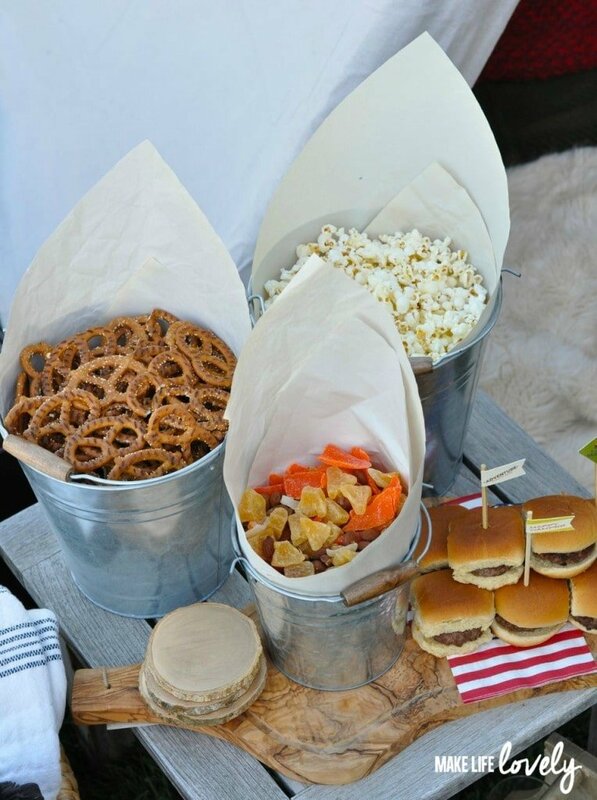 Will you have a glamp out movie night? Oh my gosh! This is stunning! Love your work!! How fun Laura-love all the details! I’d have to take some big fluffy pillows and snuggly quilts…we would definitely set up our camping hammock too! This is AMAZING, Laura! I want to come sleep under the stars with you guys! Love to do this with the grandsons. We’d have to include lots of bug repellent though. I really want to make the A frame! This is my kind of campout! I’ve always wanted to get an old camper and transform it into a glamper. (Kicking myself that I didn’t claim my grandmother’s old one!) And when I do go glamping, I want to go with you. 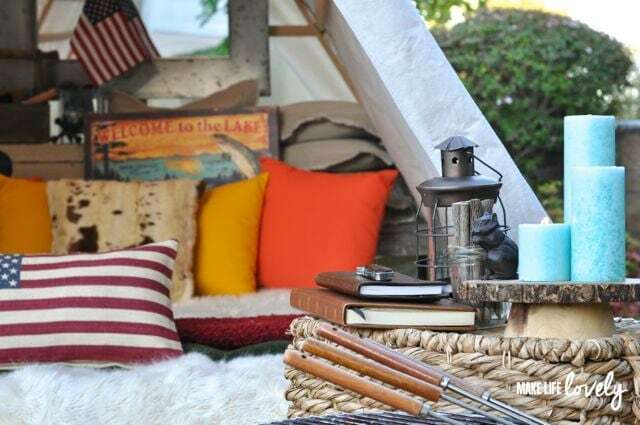 Everything about your campout looks amazing! And those s’mores! This is absolutely amazing!! I want to pull this off for the girls! Wow!! Wow this is absolutely amazing and inspiring!!!!!!!!!!!!!!!!!! LOVE it all!